A simple Sunday calls for a simple soup…and it doesn’t get more simple than a crockpot soup. 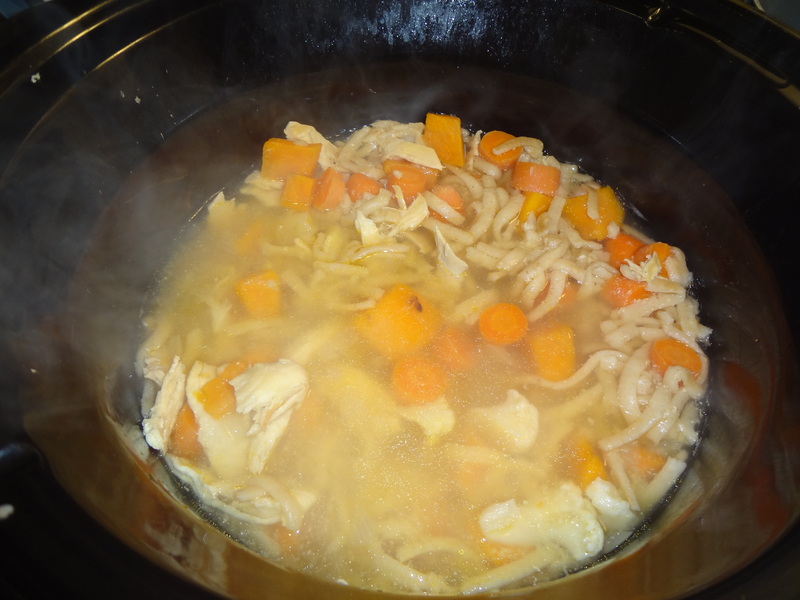 Today I was craving a classic: chicken noodle soup. This was super simple to make and it’s a perfect meal for lunch or dinner. 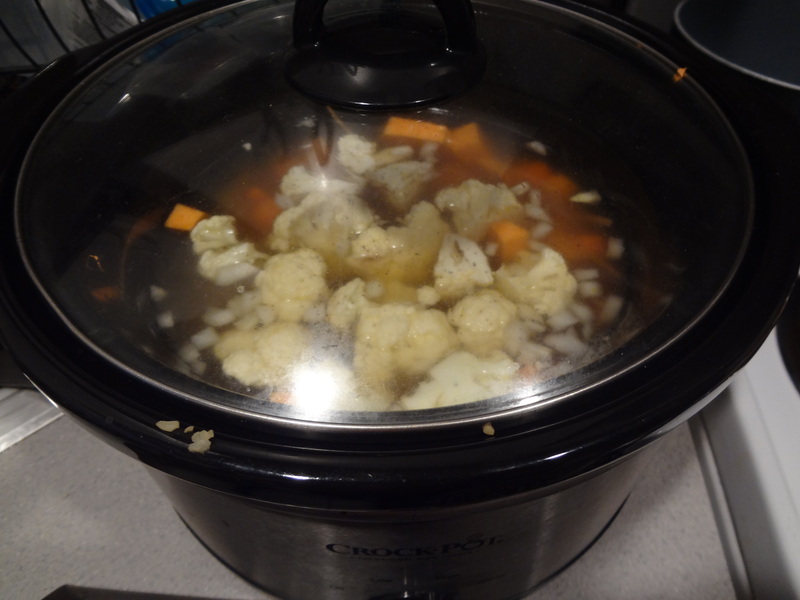 To me, the best thing about preparing a crockpot meal is that you can wing it…as in throw anything into it and make it work…hence my desire to throw in all of my almost-spoiled vegetables. 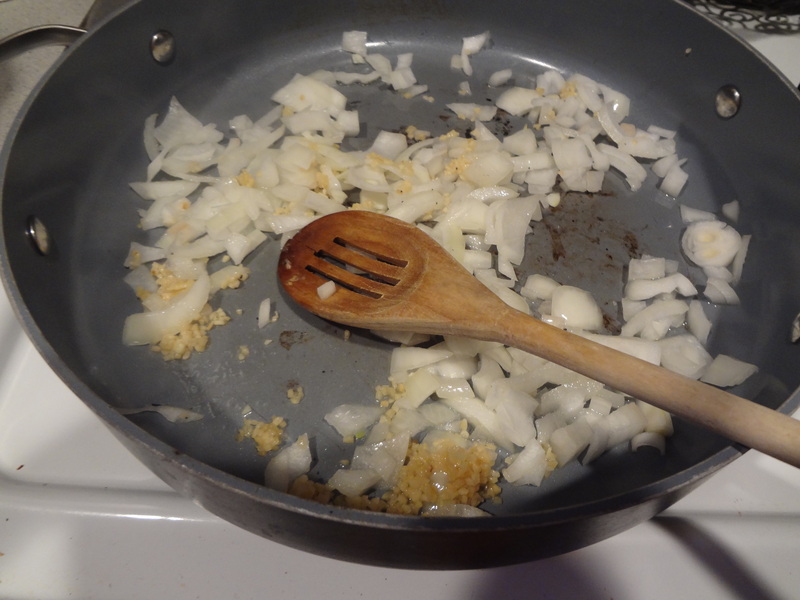 Plus, I improvised the recipe even more, tweaking it to involve certain ingredients I had on hand and needed to use. To be truthful, I didn’t feel well enough to leave my house today, so I had no choice but to use what I had! For instance, I didn’t have any celery on hand, so I substituted a sweet potato instead. Also, I used whole wheat linguine instead of egg noodles, because that’s what I had in my pantry. 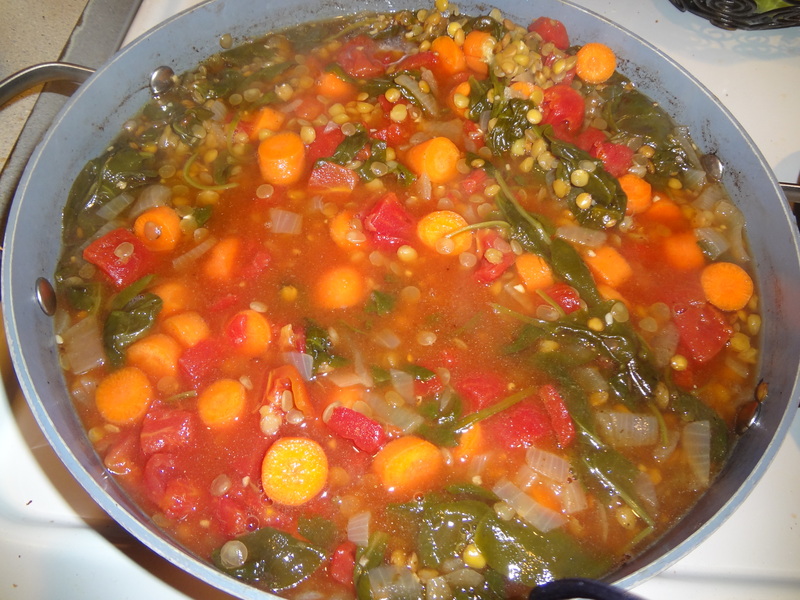 I do believe I’ll be eating this soup for the next 5 days…join me!! 1) Wash chicken breasts. 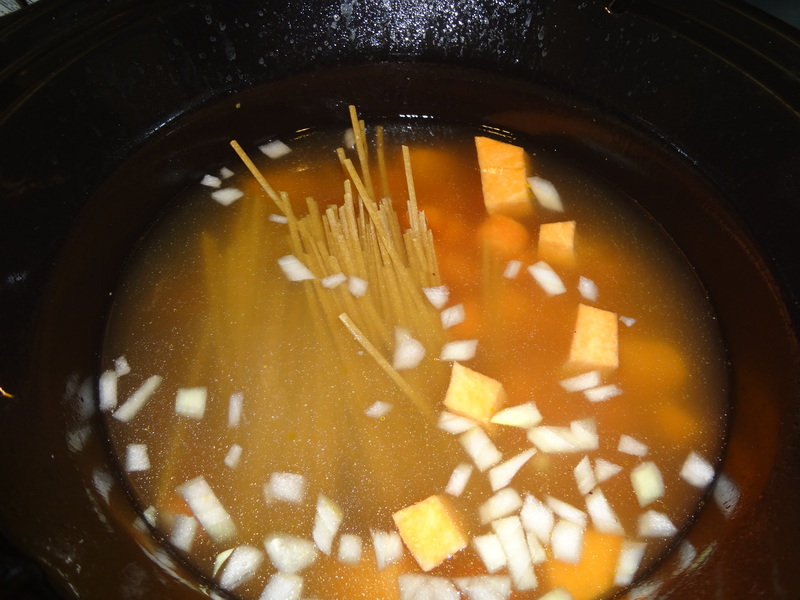 Place in crockpot, and cover with chicken broth. 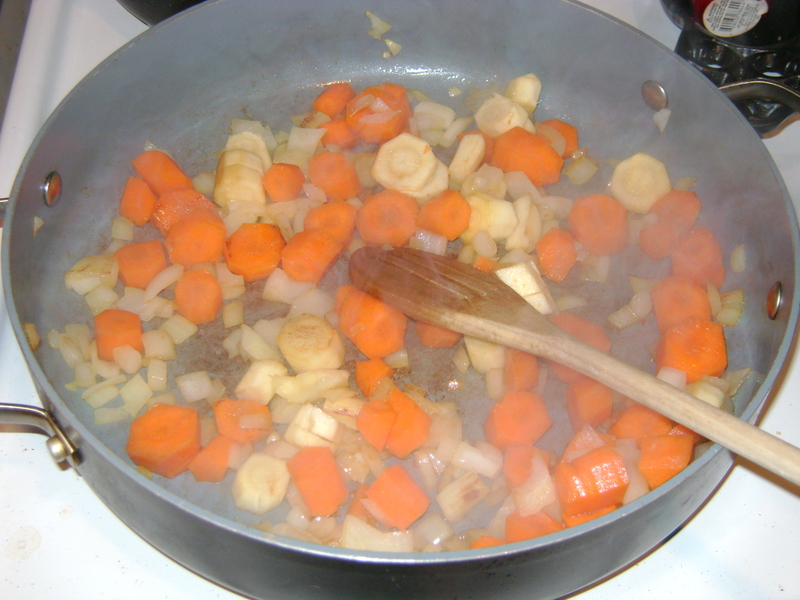 2) Cut carrots, onion, sweet potato, cauliflower, and mince garlic. Add to crockpot and cover with remaining broth. Add water and noodles. the start of the soup! 4) Remove chicken breasts once tender and shred with two forks. 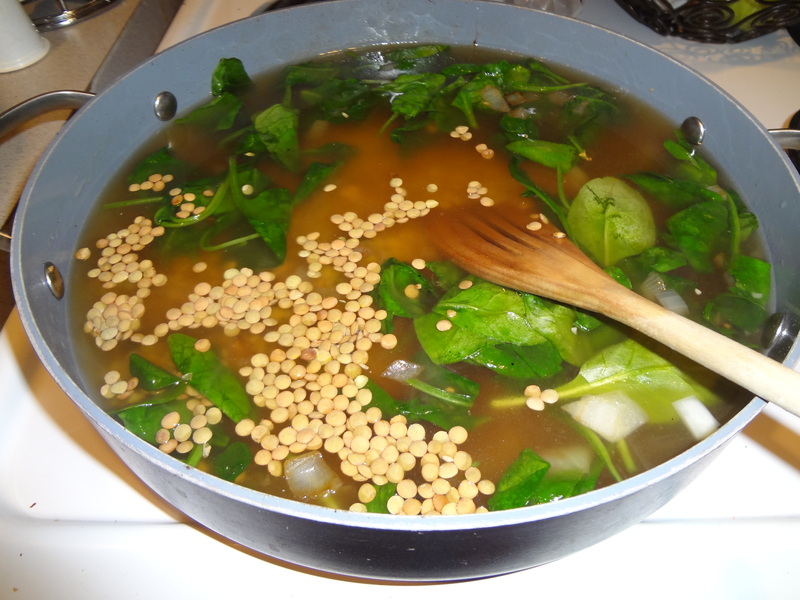 Add back into soup, stir, and serve! 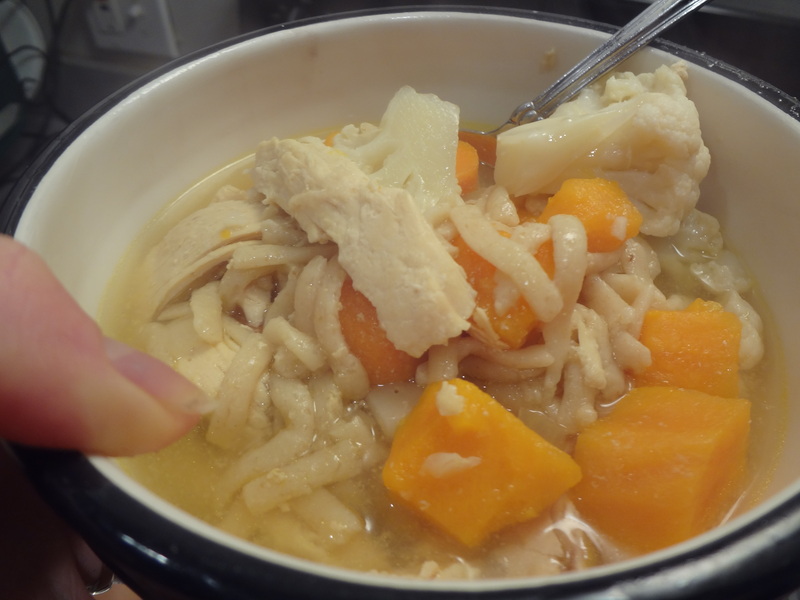 I have a feeling I’m going to be awfully sick of chicken noodle soup after this week…but for now, I’m okay with it! Over the last few years, I’ve made quite a few soups. Chicken Noodle and Broccoli Parmesan are two of my favorites. However, while I love the warmth, textures, and flavors of soup, I dislike heavy, cream-laden soups, and one bowl of “healthy” canned soup never seems to quite fill me up. Plus, I always find it difficult to carve out over an hour of prep/cook time, and it’s quite rare that I’ll have all of the ingredients on hand for one particular soup. 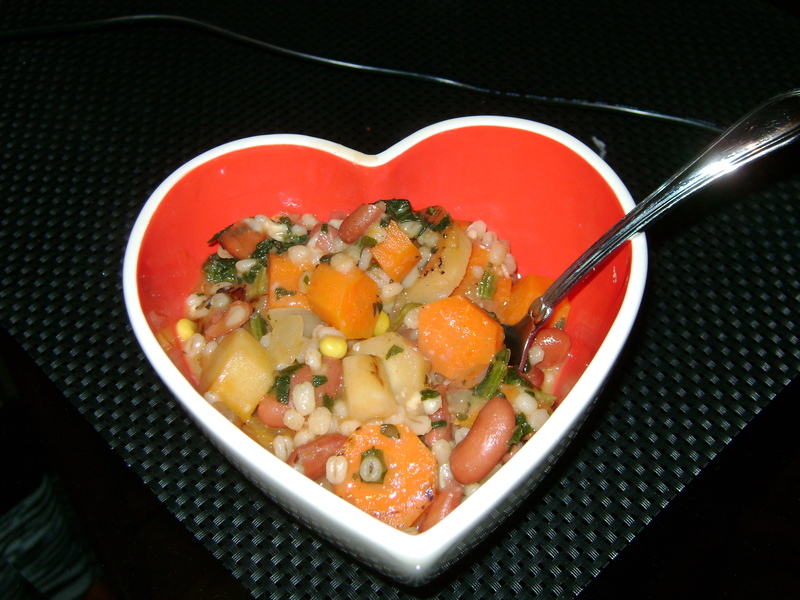 Hence the reason why I was very intrigued by Cooking Light’s hearty bean and barley soup recipe. Countless nights I’ve searched my cookbooks and consulted other blogs to find a light yet hearty soup, that‘s simple to prepare and comes together quickly. Many weeknights, I just don’t have the energy to slave away in the kitchen! When I saw this recipe, I knew I could recreate it in no time. Plus, it was easy to follow and didn’t take more than 30 minutes from start to finish. Since this soup consists mostly of staple ingredients, I had most everything right in my cupboard…I bet you do too…take a peek! 1) Bring first 3 ingredients to a boil in a Dutch oven; reduce heat to medium-low, and cook 15 minutes. Drain through a sieve into a large bowl; discard solids. 2)Measure 1 cup beans, and mash with a fork in a small bowl. Reserve the remaining whole beans. 3)Heat oil in pan over medium heat. 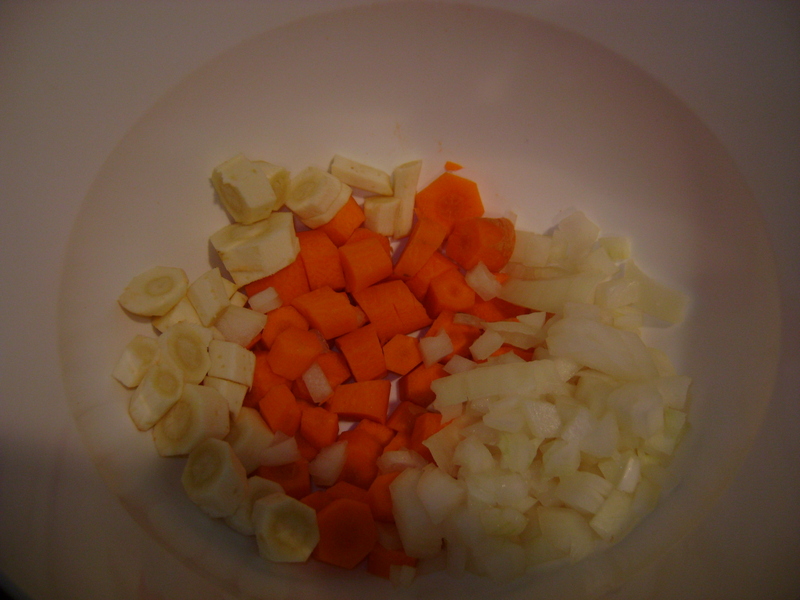 Add onions, carrot, and parsnips; cook 4 minutes. 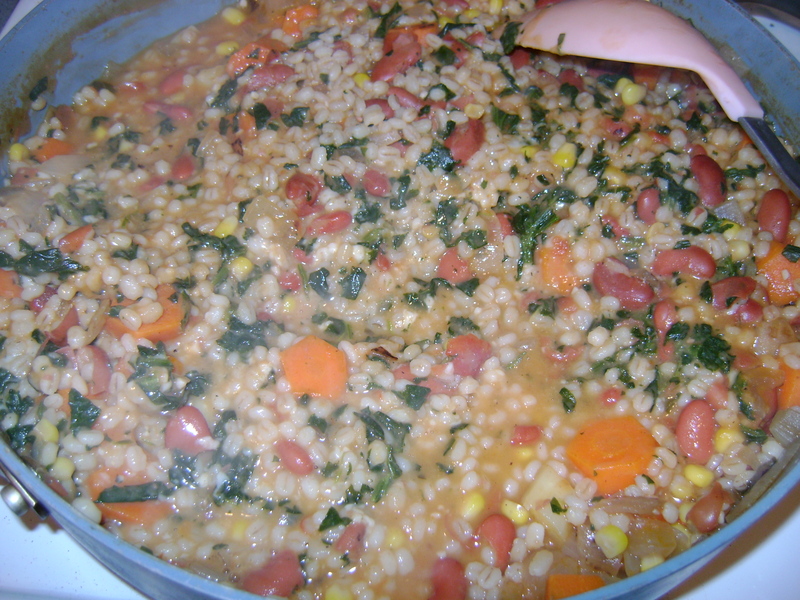 4) Add broth mixture, mashed beans, whole beans, tomatoes (or tomato sauce), and barley; bring to a boil. 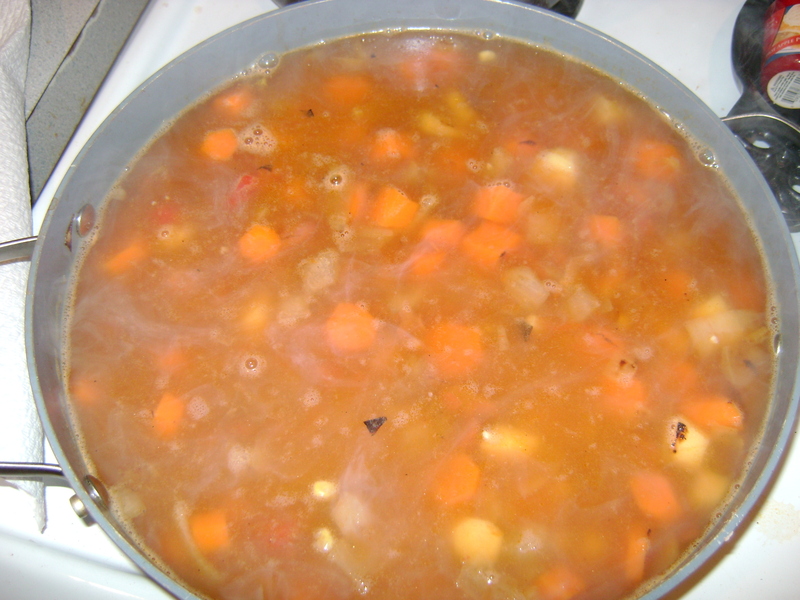 5) Reduce heat; simmer 15 minutes. 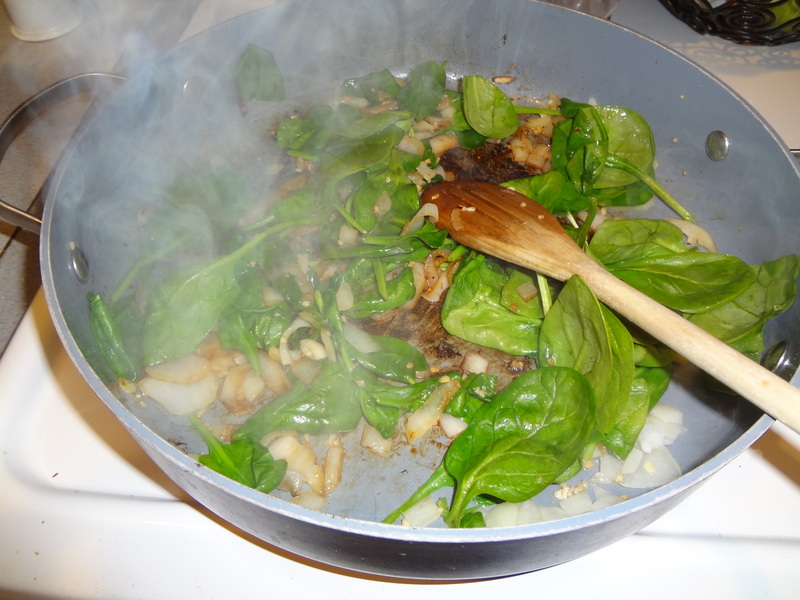 Stir in spinach and black pepper; cook 5 minutes or until barley is tender. Sprinkle each serving with cheese. Simple, satisfying, and full of flavor, I loved it. 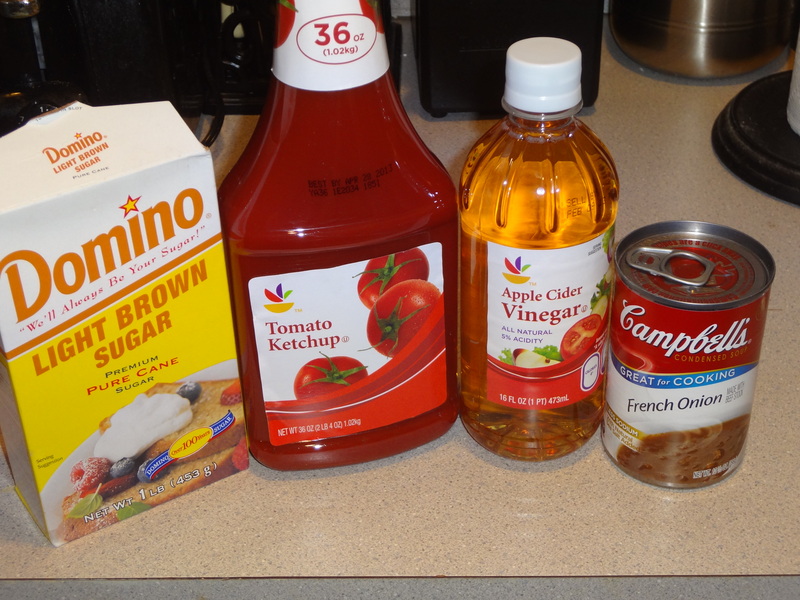 Like I did, you can customize this soup to the ingredients you have on hand. Any type of beans and root vegetables would work. I enjoyed this soup with my lunch at work all last week, steaming hot with a side of Melba sea salt crackers for dipping. Enjoy! a new favorite soup in my most favorite bowl!